Need some wheels for the four-day weekend? 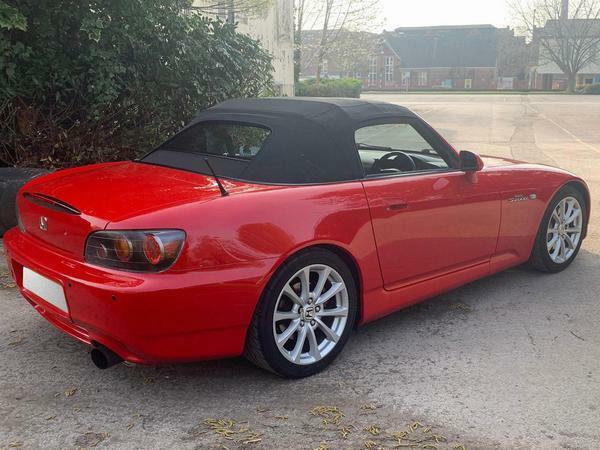 The Honda S2000 has aged remarkably well, don't you think? If it were launched today, it'd need little more than a pair of day running lights and an infotainment screen to look cutting edge. Of course, the youthful look contrasts somewhat with the traditional hardware tucked underneath, given the high-revving naturally-aspirated four-pot engine and manual gearbox that typified Honda's glory days. When it first launched back in 1999 the world was given an attainable sports that could spin its 2.0-litre engine's internals all the way to a rather exotic 9,000rpm. Oh how joyful that trait was. 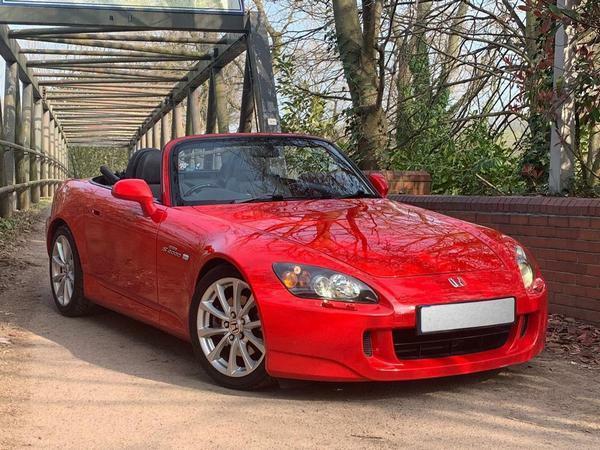 But it came with drawbacks, because without the assistance of a blower or hybrid gubbins like today's sporty stuff, the S2000 had to labour through a lacklustre bottom and mid-range, making its driver wait for a peak of just 153lb ft at 7,500rpm and 243hp 800 revs after that. 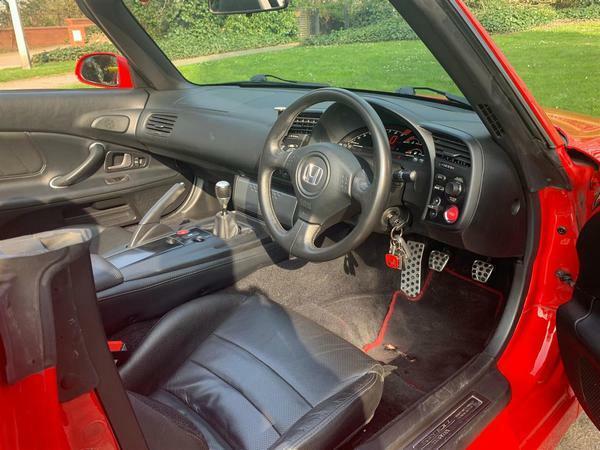 Honda's ying was the performance kick delivered by the longitudinally-mounted four as it entered its famed VTEC (y0) zone from 6,000rpm; the yang was living with the car day-to-day, as it didn't provide the muscular mid-range performance some might have expected from a two-door drop-top. It wasn't for everyone, then, but for those who loved its peaky performance, the S2000 followed the Civic Type R into Honda's hall of legends for its powertrain alone. In the right circumstance, it was an excellent handling machine as well. Since the car was conceived from the off as a convertible, its internals were packaged neatly around its rigid X-bone-based monocoque structure to give it a 50:50 weight distribution and 1,260kg kerbweight - with the former helped by the motor's far back placement under the bonnet, which made it a front-mid-engined machine. It also meant that the S2000 offered more exciting performance than the less powerful Mazda MX-5 and MG F of the day, so long as you loved the thrill of a very mobile chassis. The power delivery of the S2000 could made it spikey if you got greedy on the throttle with some steering lock on, so it demanded respect, especially in slippery conditions. But when you did nail a corner, the experience was exceptionally satisfying. Anyway, later versions were dialled back so they exhibited a more trustworthy nature, plus, the engine's top-end character was also reduced so power came in more smoothly. You could say this all helped the S2000 grow into its skin. Today's Spotted is a 2007 car, so gets all of those changes, but its previous owner has upgraded both engine and chassis to provide it with even more focus. The 75k-old car now has a carbon fibre air box, which should give the already vocal 2.0-litre a glorious induction growl under load. And it rides on Ohlins DFV coilover suspension, which is high quality kit, with Mugen bushes and matching geometry, so the car ought to provide enhanced S2000 dynamics and responses. It also suggests the previous custodian really knew their stuff, which bodes well for the condition of the rest of the car. So while this £10,250 example is far from the cheapest, it stands strong as one of the finest we've seen. I've never understood the bulls t about the F20 lacking torque - the 2019 Mazda MX-5 2 litre is almost identical torque to this. The 944's 2.7 made less torque than this, despite having Porsche's nouse and no real emissions restrictions. Find me an N/A 2.0 four that has significantly more. Ran one for 3 years as a daily driver, once you learn the car you don't feel the lack of torque off the line. Fantastic fun and bulletproof. I had one for a while back in 2006. It was an early, 1999 car. Coming from a Civic Type R I recall being totally underwhelmed at first, thinking that an extra 40bhp was somehow going to make a huge difference. It was loud, cramped and unrefined on the trip back home. I remember thinking I'd made a big mistake. But it wasn't long before I fell for its amazing engine and knife edge handling. Roof down, balmy summer night, LCD rev counter creeping past 6k, 7k, 8k. Wow. I will have another one day as it's a car that will never look old and will always have its engine to mark it out as something truly special. Still can't believe it was 13 years ago. Oh to be 24 again! I purchased one of these a year ago and love it on the whole, it’s only used as a weekends and summer drives car and is a great drive...the only modification I have done is also an induction kit to bring out the character of the engine. I wouldn’t recommend one as an everyday car though as I find it hard work when not in the mood compared to a modern FI car and the revs sit at roughly 4K on a dual carriage way at ~70 which feels wearing at times!